Mort Kunstler Handsigned and Numbered Limited Edition Print:"The Angel of the Battlefield"
Edition Size: Artist signed and Numbered to 350 on paper with 50 AP's. Canvas Editions 50 each with 15 Premiere Editions. All editions include a COA. Image Dimensions: Image size: 17" x 25-1/2" / Overall size: 22" x 29-1/2"
About the Art: In December of 1862, the small town of Fredericksburg, Virginia bore witness to one of the most one-sided battles of the entire Civil War. After crossing the Rappahannock River and taking possession of the heavily shelled town, Federal troops were devastated during a series of futile assaults on an impenetrable area beyond the city limits known as "Marye's Heights." Local churches, homes and businesses were often commandeered by the military to be used as field hospitals. Unfortunately, the conditions at these makeshift medical sites were often deplorable. One woman who was determined to improve the healthcare of wounded soldiers everywhere was a volunteer nurse named Clara Barton. After assisting surgeons in the town's battered churches, Barton went back across the river to the Lacy House, also known as Chatham. Located atop a bluff called "Stafford Heights," the estate overlooked Fredericksburg and had originally been used as the Union army headquarters prior to the battle. By her estimate, there were no fewer than twelve hundred men crowded into the rooms of the mansion, with rows more stationed outside on the cold hard ground. Lying among this sea of bloody blue uniforms were a number of gray-clad wounded in need. One rebel, Captain Thurman Thomas of the 13th Mississippi Volunteers, was caught behind enemy lines, but grateful for the mercy he received. The "Angel of the Battlefield," as Barton was called, treated the wounded Confederate with the same care and concern that she employed with her own boys. Her act of charity for Thomas and his companions echoed the sentiment that true compassion drew no political distinction. For the next two weeks Barton stayed at Chatham, where she saw "hundreds of the worst wounded men I have ever seen." Throughout the remainder of the war she routinely helped soldiers from both sides, and those who survived regarded her as their savior. Following the end of the war, Barton traveled abroad, helping to end suffering on an international level. In 1881, she founded the American Red Cross, which continues to carry on her mission of mercy today. I knew of Chatham. I saw it from Fredericksburg, on the other side of the Rappahannock, but I had never gone there. Also known as the Lacy House during the Civil War, I finally had a chance to visit the National Park Service site last year and was immediately taken with its beauty, location and history. It is located in Falmouth on what was called Stafford Heights in Stafford County and the history of the Plantation House is spectacular, as is the view of the river and Fredericksburg. The visitors list itself is awesome. It is the only building ever visited by Washington and Lincoln. Famed Virginia visitors were Thomas Jefferson and Robert E. Lee, and numerous Union generals used it as their headquarters. 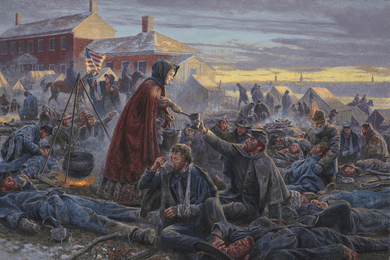 What intrigued me, as an idea for a painting, was that after the battle of Fredericksburg, the building was used as a hospital, and that both Clara Barton and Walt Whitman were there at the same time! What an opportunity: to paint Clara Barton, the icon of American nursing, and Walt Whitman, an icon of American literature! Add a beautiful building and view, and it seemed to me that this painting would almost paint itself. An extra bonus was that while caring for the wounded outside Chatham (there was not room enough inside), she tended to Confederates as well as Union soldiers. All the elements were there. The key was in the composition so that I could tell the story. By placing the scene outside, I was able to face southwest and not only get a view of the house but also capture the great vista of the �Spires of Fredericksburg.' By setting the time of day at about sunset, the lighting became my best ally. I was able to not only silhouette the city and show the Rappahannock, but use it as a spotlight on the main story, Clara Barton tending to Confederate soldier Capt. Thurman Thomas of the 13th Mississippi Volunteers. The smoke from the fires, as well as the white of the canvas from the tents that were pitched in front of the Lacy House, helped to emphasize Clara Barton and Walt Whitman as well as to tell the secondary stories. Beyond the courage and compassion that she showed on the battlefield, Clara Barton's greatest feat was the founding of the American Red Cross. According to their website, "Barton's legacy is reflected in the volunteers and services provided daily by the American Red Cross today." I hope this painting passes on to the viewer the emotions that I felt while painting it and is accepted as my personal tribute to Clara Barton and the entire nursing profession. What would we do without them? I would like to also give my thanks to Mr. Donald Pfanz, National Park Services staff historian at Fredericksburg Battlefield, and Mr. Richard Ryan, curator for the Walt Whitman Birthplace Association for their advise, expertise and insights regarding Clara Barton at Chatham.